Taika Waititi has made a run of successful films, most of which mix comedy with moments of drama. Waititi's belief is that putting happiness and joy on screen is a worthy challenge, and that comedy is underrated. Taika Waititi (sometimes credited as Taika Cohen) is of Te-Whānau-ā-Apanui descent, and hails from the Raukokore region of the East Coast. He grew up on the East Coast and in Wellington, the son of a school teacher and an artist. Ambitions to be a painter or deep sea diver were sidelined after a high school drama teacher opened his eyes to acting. 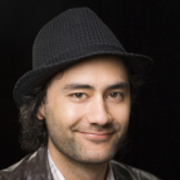 Waititi graduated from Victoria University in 1996, with a degree in Theatre and Film. In 2000 he was nominated for an NZ Film Award for Best Actor, after playing a lothario student Alex in hit film Scarfies. Intrigued by the idea of working on a road movie, he was a modern day hippy in Snakeskin — director Gillian Ashurst praised his "presence and style" — and one of the strippers in TV's The Strip. A genuine renaissance man, Waititi has also won acclaim for his painting, photography, design and stand-up comedy. After forming Humourbeasts with Jemaine Clement, the duo won the Billy T comedy award in 1999. When they performed at the Edinburgh Fringe Festival in 2002, Waititi also cameoed on television as wisecracking manager to Clement and Bret McKenzie's own act Flight of the Conchords, and soon after performed on TV's Pulp Comedy. Tiring of the film roles he was being offered — which often meant playing comic relief — Waititi decided to have a go at making "my own stories". At that point his "main thing was painting". Waititi began winning attention and awards with the comical shorts he directed and acted in for the yearly 48 Hour film contest (in one of them he played almost every role). But his award-winning streak as a filmmaker is usually said to have began with 2003's Two Cars, One Night. A sweet, understated tale set in the car park outside a pub, the black and white short was a hit on the international film festival circuit. It won more than a dozen awards, including Best International Short Film at the American Film Institute festival, and best short in its section at a trio of German festivals (Berlin, Oberhausen and Hamburg). In 2005 Two Cars, One Night was nominated for Best Live Action Short at the Academy Awards. When the nomination was announced during the ceremony, he gained notoriety — and some animosity — by feigning sleep, after having tried to persuade the other nominees to do the same. "When something like that happens," said Waititi of the nomination, "it meant film had to become my job in a way." Waititi cemented his success the same year with short Tama Tū, a slice of life portrait of a troop of soldiers from the Māori Battalion, during World War II. Invited to more than 40 festivals, it picked up prizes at ten, including Sundance, Stockholm and Berlin. He talks about the film in this video interview. Waititi's first feature was 2007's Eagle vs Shark. The film bypassed the Māori-influenced humour of his early work, in favour of deadpan geeks. The film chronicles two lonely misfits and their bumbling attempts to find love. Starring were then partner Loren Taylor (playing a character she'd originated) and Waititi's former Humourbeasts partner Jemaine Clement. The script was created at high speed for the Sundance Institute Directors Lab. Eagle vs Shark went on to win Best Screenplay at the US Comedy Arts Festival, and Best Feature at the Newport Film Festival. On the eve of the film's premiere at Sundance in the United States, Variety magazine named Waititi as one of 10 directors to watch. In 2006, Waititi was made a NZ Arts Foundation 'New Generation' Laureate. The following year he helmed the first of four episodes of Flight of the Conchords (including the final episode). Waititi had begun writing his second feature, Boy (working titles Choice and The Volcano) long before Eagle vs Shark. The tale grew more comedic as it developed, influenced partly by memories of growing up, and some of the ideas introduced in Two Cars, One Night. Boy centres on an 11-year-old boy (James Rolleston) who spins fantasies about his ex-con father (played by Waititi), who turns up unexpectedly with members of his gang. After winning a place at the 2010 Berlin Film Festival, Boy was awarded Grand Prize in the Generation section, one of five sections devoted to new films. The Generation section showcases "lively cinema aimed at young audiences". It was also one of only 14 films to make it into the Sundance Film Festival's 'World Cinema' section, and a double award-winner at the 2010 Cinekid Festival in Amsterdam. Within four weeks of its New Zealand release, Boy had grossed $4 million, after pushing ahead of Sione's Wedding as the most successful Kiwi comedy released on home soil. After another four weeks it had overtaken The World's Fastest Indian as the most successful local film in the country's history (not accounting for inflation). Later Waititi raised US$100,000 in a crowdfunding campaign which was aimed at expanding Boy's release in the United States. At the 2010 Qantas Film and Television Awards he scored a triple header by winning awards for best director, screenplay and supporting actor — plus best film. Boy joins Peter Jackson's Bad Taste as one of the few Kiwi feature films in which the director also takes a leading role on-screen. Boy also won for cinematography, editing and music. Plans to attend Boy's March 2010 Kiwi premiere were abandoned after Waititi won the chance to fly to New Orleans and "pursue my dream of becoming the next Cliff Curtis". Waititi had won a role as the Inuit sidekick to superhero The Green Lantern, for New Zealand-born director Martin Campbell. By now Waititi's career had become an extended case of ocean-hopping. At home, he acted alongside members of the Naked Samoans in sketch show Radiradira, and directed the first season of semi-improvised Madeleine Sami comedy Super City. The series showcases Sami portraying a variety of characters. Around the same time Waititi began directing episodes (including the pilot) for a short-lived US series inspired by Bafta-nominated sitcom The Inbetweeners. The series revolves around four teenage boys who are caught between being cool and geeky. Waititi also wrote and directed a pilot of Super City for American network ABC, but the series did not get made. Meanwhile he was also continuing a solid record of invites to American festival Sundance. In 2012 he starred in Sundance-nominated comedy short The Captain, while the 2013 festival saw the premiere of movie What We Do in the Shadows (in the midnight section). Based on a short Waititi and Jemaine Clement had made back in 2006, the mockumentary sees the pair co-directing — and also playing vampires sharing a flat in modern-day Wellington. A hit on its home territory, and winner of a Moa award for Best Self-Funded Feature, Shadows won rave reviews in America and NZ, and sold to multiple territories. Waititi is involved in three different spin-offs: semi-sequel We're Wolves, and two television projects: Wellington Paranormal, and a Shadows series set in New York. Waititi followed Shadows with Hunt for the Wilderpeople, based on Barry Crump novel Wild Pork and Watercress. The comedic adventure centres on a city kid (Julian Dennison, from rite of passage drama Shopping) on the run in the bush with his cantankerous uncle (Sam Neill). Dennison and Waititi had first worked together on this drug driving commercial. Wilderpeople debuted at Sundance in January 2016 to enthusiastic reviews; Dennison got a standing ovation. Released in New Zealand two months later, it swiftly broke records for the opening day and opening weekend of a local film; within seven weeks it had overtaken Boy to become Aotearoa's biggest local hit (not accounting for inflation). It also netted Waititi NZ Film Awards for Best Film, Director and Screenplay. Waititi's next project marked his "first big studio film" as director— Thor: Ragnarok, the third movie to star Marvel superhero Thor. The film opened in October 2017 to blockbuster international box office, and many reviews praising its sense of fun. Empire's James Dywer argued that the film preserved Waititi's comic sensibility, and was "the boldest, most outrageously fun film Marvel has yet produced". Upcoming projects include World War ll drama Jojo Rabbit (whose cast includes Scarlett Johansson, Kiwi Thomasin McKenzie, and Waititi), episodes of live action Star Wars TV series The Mandalorian, and a stop motion retelling of Michael Jackson's story, through the eyes of his pet chimpanzee Bubbles. In 2015 Waititi directed the star-studded video for charity/All Black supporters song 'Team Ball Player Thing', and was part of the team behind Māori Television satirical show Brown Eye. Waititi helped out US animation legends John Musker and Ron Clement (Aladdin, The Little Mermaid ) in the early stages of developing Disney hit Moana, and campaigned for the film to be dubbed into te reo, long before it became an international hit. Waititi has directed commercials in the United Kingdom and the United States, including a quirky Cadbury promo for the London Olympics, sung underwater to Tina Turner's 'Simply the Best'. He also marshalled a musical promo loaded with the stars of American network NBC, which screened in a high-rating telecast of the 2012 Super Bowl. In February 2017 Waititi was named New Zealander of the Year. Chief Judge Cameron Bennett said that Waititi's films "represent the importance of whanau, of belonging and the challenges facing youth at the margins of society".